Hello friends!! Happy Friday to you all! Hope you all are having a great day and starting a great weekend! I have a fun and (not) Spooky project for you. Making this card was a lot of fun and doesn't include any stamps!! Yes! The skull is a stencil from A Colorful Life Designs and it's called Sugar Skull Sun Eye. Position your stencil on a piece of black cardstock and cover the spaces with White Pigment Ink. After the pigment is dry, position the stencil again on the image and color it with pencils, here I used Prismacolor Pencils. After that, die-cut the piece. Adhere panel to a white card base. Die-cut sentiment and adhere it to card front. Easy peasy, right?! This card didn't take much time to make, you can add the pigment the night before or use your heat gun to dry the pigment out, I do prefer to let it dry overnight. Simon Says Wednesday Challenge: Halloween / Spooky. I have projects to share with you later, but for now I want to share a couple of great SALES!! Altenew has a DIE SALE going on!! 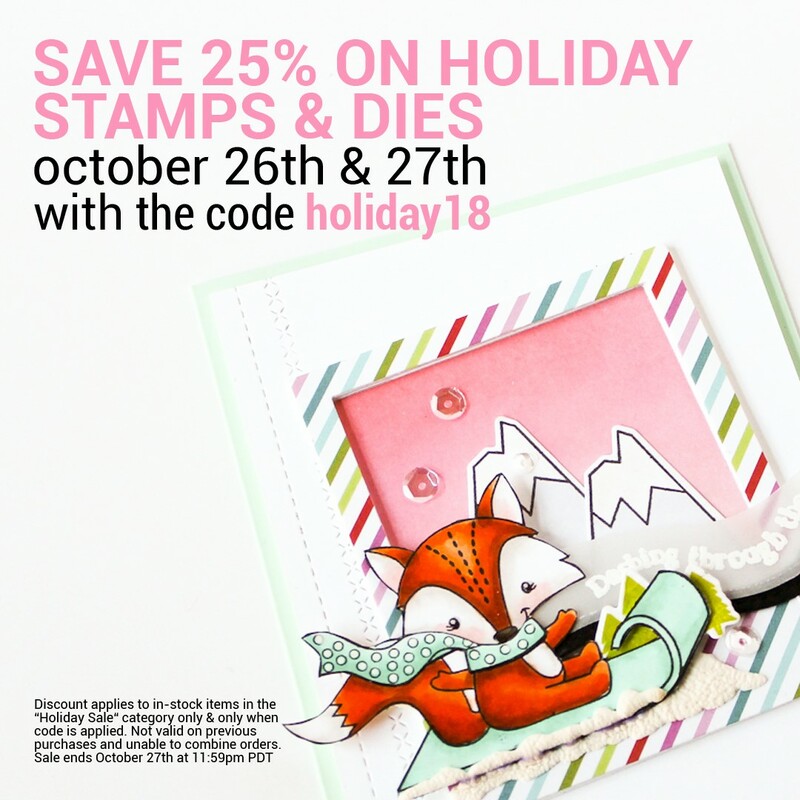 15% OFF on ALL DIES! Save 25% on Holiday Stamp and Dies!! Hope you all are having a wonderful day/week! Today, I have a fun project I created few days ago. I got this fun Halloween Boo Wood Swag kit from Adornit. I will try to take another picture, it was hard up or down, lol. All the letters are wood, just traced them on patterned paper and glue them, then inked all the edges! Hello friends!! Hope you all are having an amazing day!! It is time for a new Impression Obsession Challenge "Happy Haunting"
To enter the challenge go to the Impression Obsession blog (all the details are there!). A random challenge card will be selected to showcase on the IO blog AND you can to enter to win a $25 gift certificate to IO just by playing! (IO stamps need to be used). My project today is a very Clean and Simple style. I stamped the "Black Cats" Background stamp direct on the front of a white card base in Black Ink. Then, stamped the "Happy Thanksgiving" sentiment on a piece of vellum in Versamark Ink, added Gold Embossing powder and heat set. I used staples to adhere it to the card front. Finally, I added sequins and red rhinestones. Now, visit the Impression Obsession Blog for more details! Be merry & bright + a SALE!!! This year I have decided I will make as many Christmas cards I can, and this design was so easy and fast to make, I think I will make a lot of more like this one!! The shimmery background is wonderful, very elegant in my humble opinion and the this die is just perfect!! Die-cut the Merry Word Block in White Cardstock (x3), then glue then together. Put a acrylic block or some light weight to help the pieces to adhere faster. Create a background with Alcohol Ink Reinkers: Watermelon, Espresso, Pool in White Yupo Paper and Alcohol Blending Solution. When the inks are drying and are a bit sticky add gold flakes and put a little bit of pressure to be sure they are sticking to the paper. Cut the piece a bit bigger than the die-cut panel. Adhere the yupo paper to a White card base, the adhere the die-cut panel. Now, do you like this die? 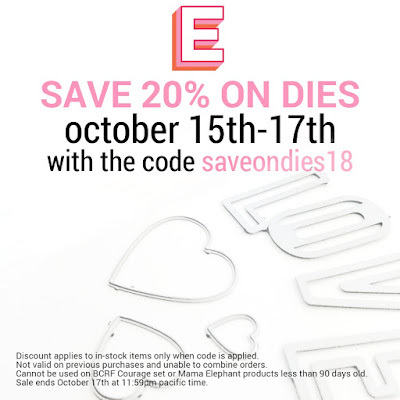 Ellen Hutson is having a Die SALE!!! 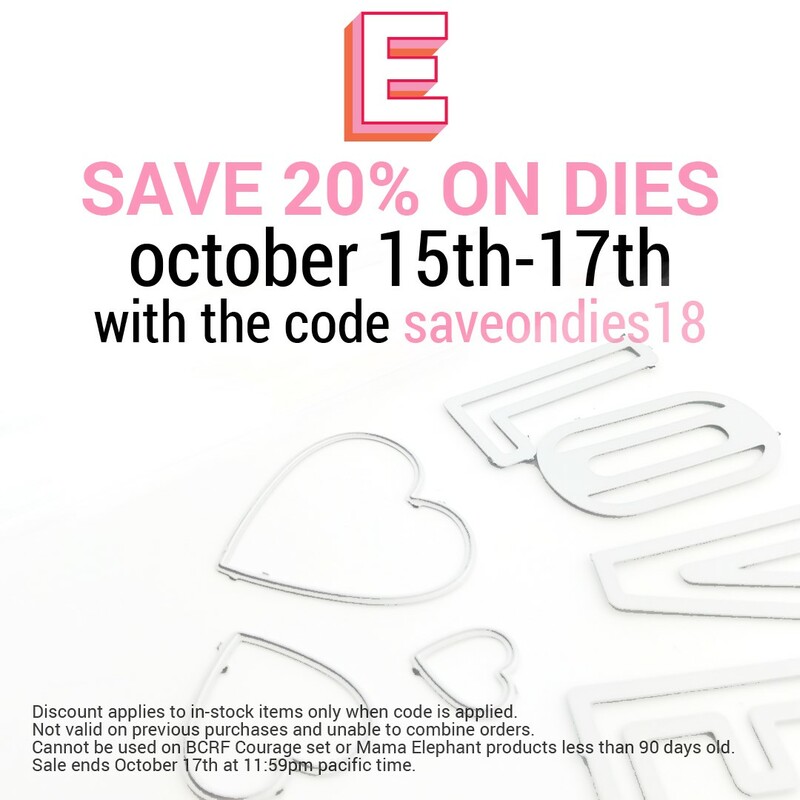 Sale ends October 17th at 11:59 pm Pacific Time. Hello friends!! Happy Monday, hope you all are starting a great week! I have the privilege to work with a couple of sets from the new Spellbinders Charming Christmas Collection by Becca Feeken! Becca's dies are so pretty and elegant! For this set of 3 I used the Shapeabilities Charming Christmas Words Etched Dies , this is a set of six dies with the phrase HO HO HO, FA LA LA and NOEL in a border format with an inner word pattern and an outline for each. So, I die-cut a lot of them in blue and red metallic cardstock. Created window frames with square dies in white and silver metallic cardstock, then adhered the word dies behind the window and then added foam adhesive to adhere it to a white card base. The Noel and Fa la la cards are 5.5" square cards and the Ho Ho Ho is A2 size. I decorate them with the bells and snowflakes from Shapeabilities Charming Snowflake Doily Etched Dies. Here are individual pictures of the cards. For the next 2 cards I used the new Shapeabilities Charming Snowflake Doily Etched Dies. This is a six piece set centered around a lovely doily shape inspired by snowflakes with its outer rim die. It also includes two charms and a snowflake accent piece that can be place in the center of doily. Here I die-cut the outer piece in pink cardstock and the outer and doily piece in gold cardstock, then adhered the together with a piece of silver glitter cardstock in between. Piece was added to a white card base with patterned paper. Sentiment and ribbon added, White and Rhubarb Crystal drops to embellish. I really love this one! I die-cut the doily part only on a piece of cream cardstock, then the outer area was die-cut on a piece of regular pink cardstock. I sponged the outer piece with Bubblegum ink, mat pieces together, added sentiment and a blue bell. Today, I want to share with you some cute Christmas Tags I created using the new Christmas Whimsy Background Stamp!! I stamped the Christmas Whimsy Background on Pink and Light Green Cardstock in Cherry and Teal Ink, then stamped on top the Textured Newsprint Stamp, in Beige Ink, it gives more textured to the image. Then I used tag dies to die-cut the images, also die-cut a bigger tag in solid cardstock color to adhere behind the stamped tag. Added a die-cut snowflake and button, and a Merry Christmas little tag on top. Very easy, cute and beautiful! Simon Says Wednesday Challenge: Anything but a card. Hope you like these tags! Labels: Blog Challenge, Technique Junkies. I want to share with you a card I made using a stencil as my focal point! So fun, fast and easy!! For this project I used "Fiesta Swirls" Stencil from A Colorful Life Designs and Banana, Rose, Violet, Mint inks from Impression Obsession the sentiment is from "Wreath Turnabout" from Concord & 9th. After that, die-cut the panel and adhered it to a pink piece of cardstock with foam tape, then added it to a white card base. 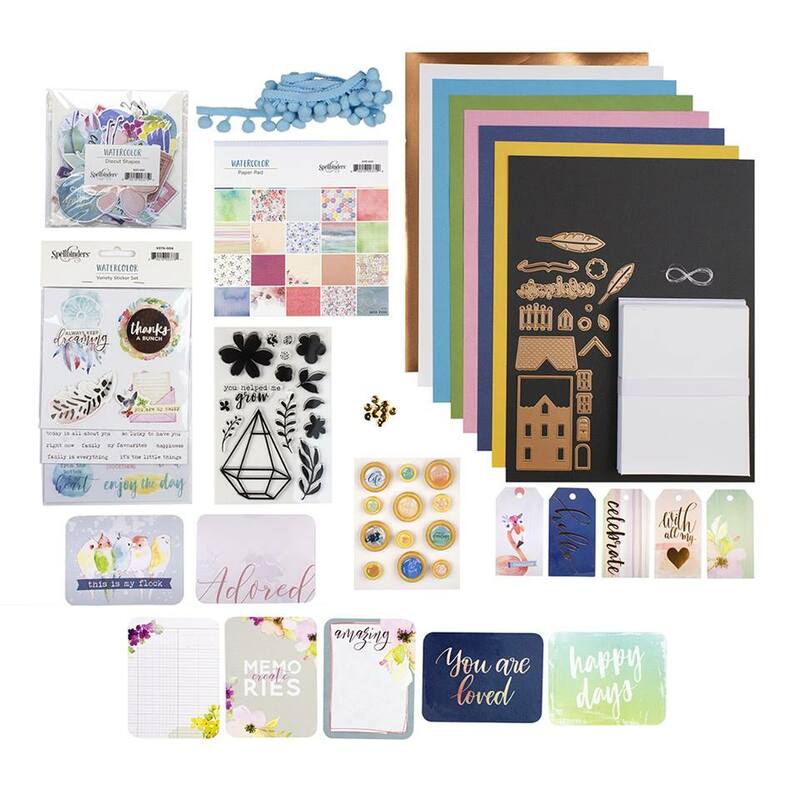 The new Spellbinders Kit of the Month is spectacular! Love it very much! I made these 5 cards in no time, so easy to put pieces together, you will seriously love this kit, plus the images are adorable! Here are the individual pictures of the cards I created! Hello friends!! Hope you all are having a great day/night. I have been a little slow lately, my family is dealing with the cold and cough, ugh, no fun at all, but I crafted a little bit the other, just took a little longer to edit my pictures since I was not feeling the best. 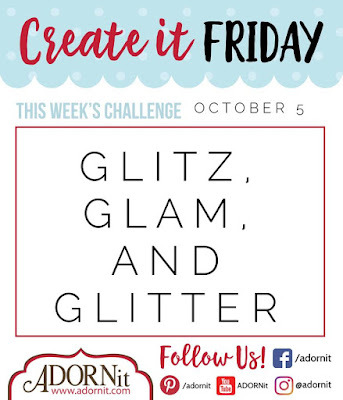 Anyway, every Friday, AdornIt has a new challenge every Friday! You can play along as many times as you wish, just go to the AdornIt Group Join The Party on Facebook and add you project where you see this post. I created 2 cards, I love using my shimmery markers and Wink of Stella and glitter, you get the idea. So I used Hello Friend Mini Coloring Book, colored the images with watercolor pencils, then added Copic and Shimmering Makers. For this card, I used Pink Chevron Paper , sentiment is from Built a Flower: Cattleya Set. Embellished the card with Simply White Nuvo Crystal Drops. Birds of a Feather Paper. Hello friends and Happy Sunday!! Today, I have a very easy card to share with you using this wonderful stencil from A Colorful Life Designs. The inspiration of this card comes from CASology Challenge : Gratitude. Ok, let me tell you what I did. Adhere the Leaves Stencil on a piece of White Cardstock, tape it to avoid the stencil to move when you start sponging it. Then use the colors of your preference, here I used Distress Oxide Fossilized Amber, Distress Oxide Peeled Paint, Distress Oxide Wilted Violet and Distress Vintage Photo. Trim the paper to, add thin gold tape to the sides. Stamp sentiment on a piece of white cardstock, add gold tape as well. Remember you can get this stencil and so much more with a 15% off until tonight!! Hello friends!! Happy World Card Making Day!! I made 7 cards today!! It has been a very long time since I made 7 cards in one day. Anyway, I will be showing you the projects I made in the next few days. Tonight, I want to show the card I made using the Ellen Hutson Essentials Challenge. For my card I used the brand new set "Mondo Holly", well released few weeks ago, but I finally had the chance to ink it up. I stamped the image on a piece of Watercolor Paper in Versamark Watermark Ink, then added White Embossing powder and heat set it. Colored the image with watercolor pencils, then added some shimmer using Spectrum Sparkle Markers (Cosmos, Olive Jade and Moonlight) and Clear Wink of Stella. Cut around the leaves I wanted to keep as a whole, then die-cut the piece using circle dies. Created a card base from White Cardstock (5.5" square), created a panel with Green Shimmering cardstock and Patterned Paper (old one but good one), then added the image and sentiment that was stamped on a piece of white cardstock in Chocolate ink. Added sequins and little drop of White Nuvo Crystal Drops. Here you can see the shiny image. 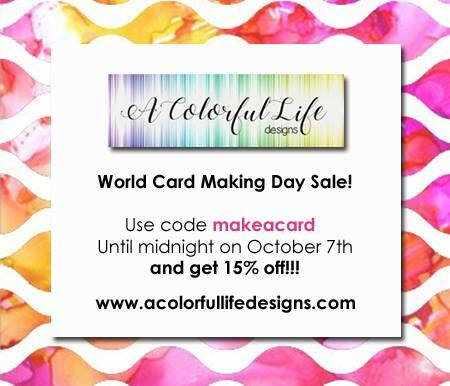 World Card Making Day SALES!!! 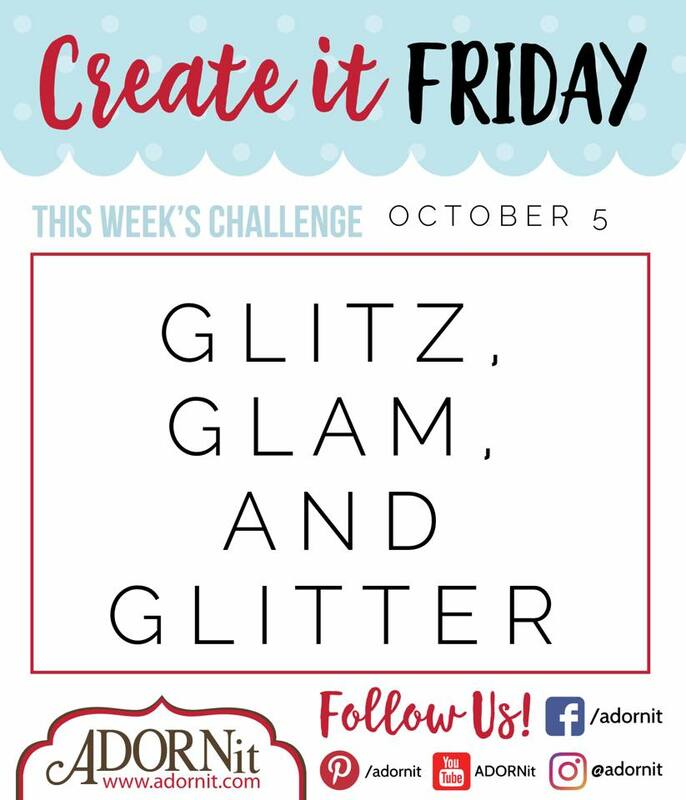 Impression Obsession Challenge: Make It Sparkle!! 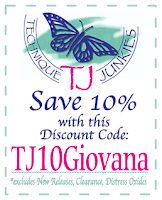 Technique Junkies October Release is here! !